Before we get started, I want to talk a little bit about the size of our panels versus what you may buy online. There are a lot of different brands of frames out in the market, and most of them top out at around 72”. A six foot tall panel might sound plenty big, but when you are shooting someone who is tall, you are not going to have the area of coverage you need around your model’s head. To remedy this, you will have to attach the panel to your light stands, using an adapter, to raise it off the floor. The panels we are going to create measure in at roughly seven feet tall, giving you a little more headroom and allowing you to free up your light stands for things such as… lights! With that being said, while the panel part of this project is pretty quick and easy, creating the fabrics can be a bit more daunting, especially if you are uncomfortable around a sewing machine. If you do not want to tackle making your own fabrics, you can still clamp large pieces of fabrics to the frame – such as bed sheets. Another option would be to build your frames to the smaller dimensions as a name-brand panel, then purchase the fabrics from that company. The money you save building the panels might even be enough to cover the cost of the fabrics. 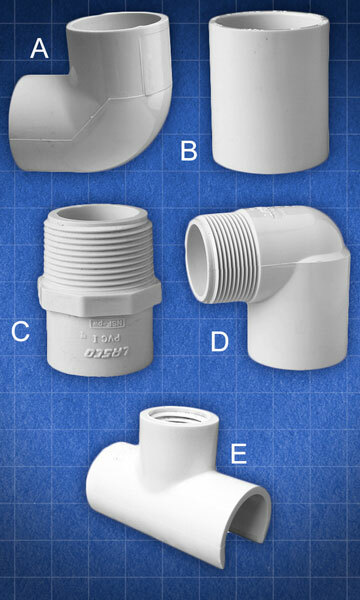 As far as PVC goes, your local hardware store will most likely have two lengths to choose from. Depending on how you are going to transport the PVC, you can choose between the standard 10 foot sections or pre-cut five foot sections. The 10 foot sections will save you more money, but getting them home may prove a bit tricky, unless you have a long vehicle such as a truck, SUV, or van. I like to build my panels out of ¾” Schedule 40 pipe. Schedule 40 is both rigid and lightweight. If you decide to buy the PVC in 10 foot sections, you will need three pieces per panel. If you go with five foot sections, you are going to need six pieces per panel. That should do it. Let’s get started on the panel. 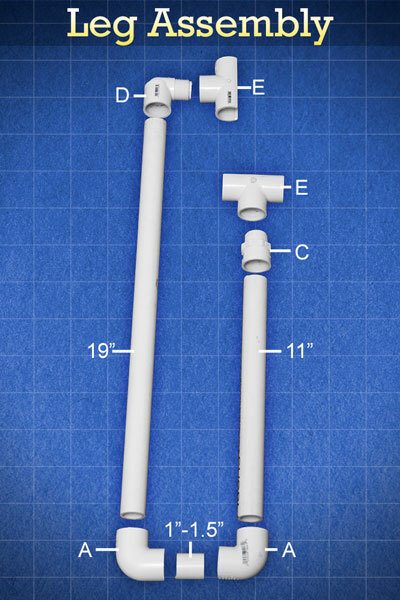 With your tape measure and marker, measure and mark your cuts on each section of pipe. 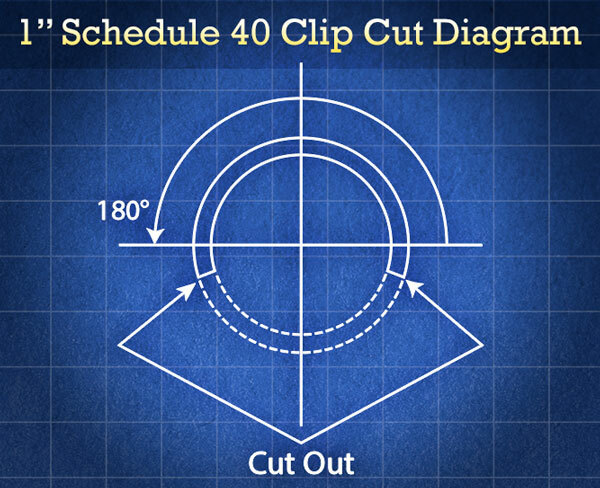 When measuring your cuts, be sure to start your measurement from the last mark you made. Next, take one of your leftover scrap pieces and cut two small sections of pipe, roughly 1.25” inches in length. These will later be inserted into the elbow joints of the legs, so that they can pivot. 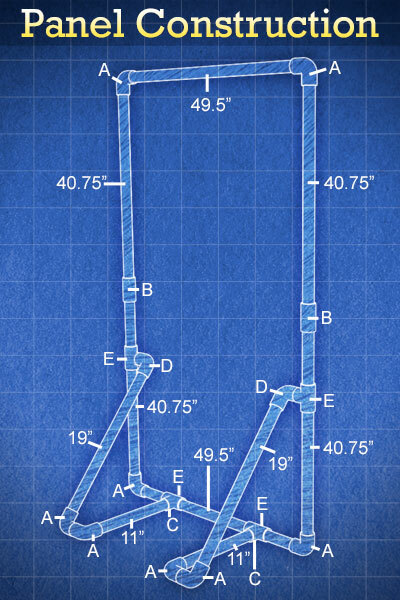 Assembly diagram showing each length of pipe, and each fitting, that make up the completed light panel. Letters coincide with above fitting diagram. To create the sides of the panel, join together the ends of two side pieces with a coupler. Next, connect the top and bottom sections to the side pieces using 90 degree elbows. Three short sections of PVC are all that make up the feet for your panel. First, add a 90 degree elbow to the 19″ and 11″ pieces of pipe. Attach the threaded coupler adapter to the other end of the 11” piece, then attach the 90 degree street elbow to the other end of the 19” piece. Next, screw a threaded saddle tee connector onto each of the threaded adapters. Finally, join the two pieces together by inserting the small piece of PVC between the two 90 degree elbows. You should now have a pivoting leg that can snap onto your panel, so that it can stand on its own without having to attach it to a light stand. Assembly diagram showing how to assemble the snap-on panel legs. Letters coincide with the above fitting diagram. The shape of the legs are great for placing sandbags on, whenever you are on location and it is breezy. The fabrics for the panels can be made by cutting out pieces of material, about 2-3 inches larger than the 4’ x 7’ frame, then hemming them. Hemming is not required but will keep the edges tidy and professional looking. To make the fabric panels easier to attach to the frames, sew 10” strips of wide elastic on a diagonal to the back corners of each piece. Once added, attaching the panels to the frames is as easy as slipping each corner into the elastic pocket. 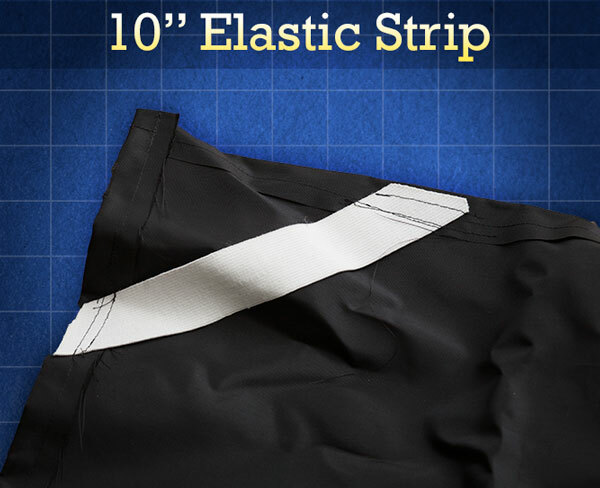 Example of elastic strip pocket, created to make fabrics easier to attach to panel frame. 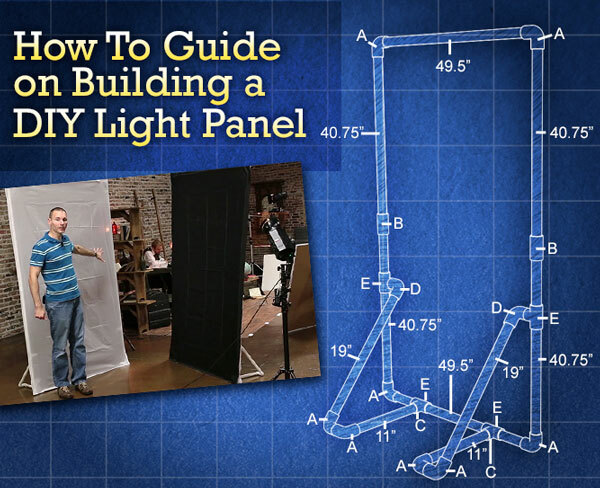 At this point, you have pretty much finished your DIY light panel. Now, I am going to show you some additions that will make your light panel even more versatile. A crossbar is a great thing to add to your panel for extra strength in outdoor windy conditions, and it can make the panel a lot easier for an assistant to hold and position. To add a crossbar to your panel, just cut out an extra 49.5” section of PVC, the same size as the top and bottom sections of our panels. Next, replace the couplings on each of the side pieces with a ¾” tee. This will give you a channel to attach your crossbar to. That is all there is to it! If you decide to make more than one panel, you are soon going to realize how cumbersome it is to dump out all the individual pieces and sort through them. To make your life a little easier, you can use a 23 foot length of thin elastic bungee (shock) cord and run it through each piece of your panel. The bungee cord keeps all your pieces together when the panel is broken down, and the slight tension helps pop the pieces into place when you are ready to set things up. To add the shock cord to your frame, lay out all the un-assembled pieces on the ground and start feeding the elastic cord through the PVC. Next, pull the two ends of the bungee cord tight until the ends of the frame touch each other, then tie the ends together. Finally, cut off and discard any extra cord. Single and double clips are an essential accessory to carry in your bag, along with your panels. Single clips offer a great way to attach pieces of fabric to your frame, or further secure your fabrics for windy conditions. To create a single clip, cut a 2” section of pipe using your shears. Next, use a Dremel tool fitted with a cutting wheel to cut a section from the PVC. (Use the circumference diagram below as a reference, to produce a sufficient clip.) Once you finish cutting out the section, use a grinding attachment to bevel, smooth, and round any rough edges. 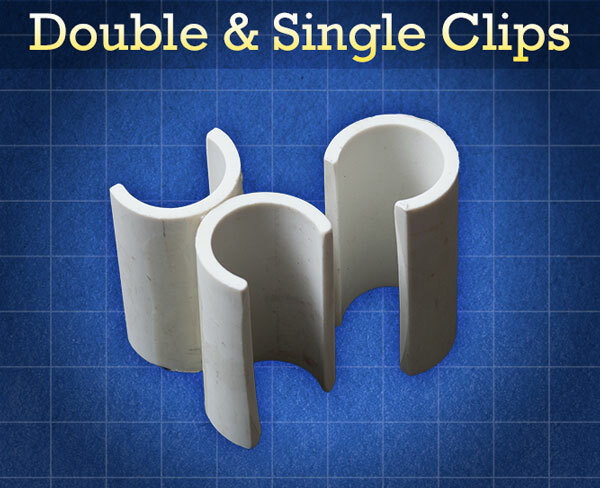 Double clips are made by cementing two single clips together, then attaching a c-clamp to them until the cement dries. These clips do an awesome job of attaching two or more frames together. For instance, by using double clips, you can create a giant 8’x7’ diffusion source, bounce source, or v-flat. Filling your tubes with spray foam might be the easiest way to add stiffness and strength to your panels. To insure that there are no voids left in the pipe during the filling process, drill a few small holes along the length of each section. The holes should be just large enough to stick the straw of the spray foam through. Once each section is filled, make sure that it is placed on a flat surface, otherwise it will stay bent once the foam dries. Wooden dowel rods are another great way to strengthen your PVC frames. This method will require a saw to cut off the excess ends of the dowels. A ¾” dowel will not fit snugly into most ¾” pipe. (The inner diameter of the pipe is more around .8”.) To remedy this, try wrapping the ends of the dowels in a few layers of gaffer or duct tape, then hammer them into the pipes using a rubber mallet. You can also try applying a large glob of PVC cement to the rod before placing it inside the tube. Once the cement dries, it should hold the dowel in place. 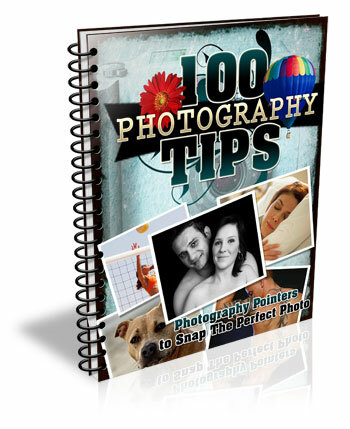 I hope this article has proven helpful and has made you excited to start using light panels in your photography. If you have not yet read the first article entitled “10 Reasons to Ditch Your Softbox for a Light Panel”, I encourage you to do so. This article shows the benefits of using a light panel over a softbox and shares techniques that will help you get the most out of using one. Until next time, go out, have fun, experiment and create something awesome! The post How to Make a DIY Light Panel or Scrim by Joel Dryer appeared first on Digital Photography School.